We've all been there - your friend Carl is over by the fridge, getting some ice, and there you are with an expensive new Carl Zeiss lens, and you're describing it to someone, and Carl keeps saying 'What? What did you say? Do you want ice?' It's confusing. No wonder then that German lens manufacturer Carl Zeiss has decided to officially drop the 'Carl' (sorry, Carl) and will henceforth be known simply as ZEISS. According to the manufacturer's blog, the decision was taken to 'create consistency' across its brand communications, given that 'the brand has been called ZEISS for a long time [and] in general language usage, 'ZEISS' is already well established in many countries and languages when referring to both the logo and the company'. Just wait for the new company called "Carl"
Sooooooooooooooooooooo.... Will Hasselblad now become Hassel? And Kodak become Obsolete: Oh that's right they already are. I suggest that they drop the SS to become ZEI. *sigh* now i need to take a sharpie to all of my lenses so no one gets confused. Zeiss Lion would've been better. 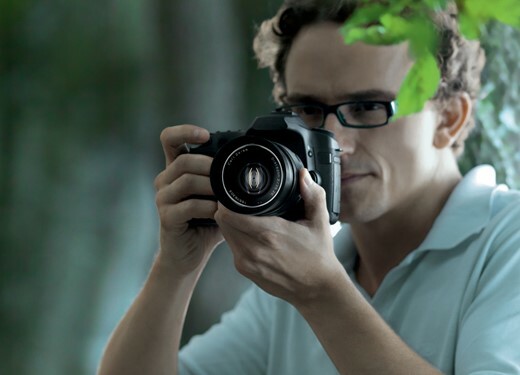 Soon after the Sony RX100 was launched, comments started appearing that the Blue Zeiss badge was starting to come off. Mine wasn't but naturally I had a pick at it and was surprised to find it wasn't the metallic enamel badge it seemed to be, but just another sticky 'label'. It's the way things are going. One of the worst inventions of modern times is.... marketing. These people profess to know everything but have created nothing themselves:) I think the family should SUE! Come back Carl, you're part of my heritage! Don't take it too hard, Carl; Ernst Leitz had both his first and last name taken off. Carl Zeiss to Zeiss Touit....LAME!!! "What Zeiss are you wearing?" "Well, get me a size zero." Carl Zeiss was a household name and seems more personal than simply Zeiss. It portrays a man that had a vision and built a company that excelled at quality products. Dropping the founders name makes this somewhat impersonal - a company taken over by the bean counters. If they should change any name it should be the "Touit" name that now goes with their new mirrorless line of lenses. Touit sounds silly and girly. These days it seems many companies keep breaking things that never needed fixing. I prefer leaving the name alone. But, I am okay with Fujifilm shortening the name to simply Fuji for obvious reasons. a great German turned into a Japanese. Thanks for posting the link. Remembering the man that built the 'name' brand helps to understand the foundation of his legacy. Ha...ha...those bought the "Carl Zeiss" lenses overnight become old lens ! Yes, yes they did. About 12 h older than they were the night previous in fact. Hard to say,may be I say may be - your great grandson can sell them off triple what you paid for, wait long long ! I don't agree with this. I realise many brands are trying to modernize, but the "Carl Zeiss" name has a cachet of quality. I'd not pleased to see it go. I totally agree. As the owner of 11 Carl Zeiss lenses from the 1930's through to 2012, I am sad that they decided to kill off poor old Carl. History should not be binned. Does this mean my Carl Zeiss lenses become collector's items? They should have dropped their prices along with the "Carl". Actually, this was quite funny in spite of the fact that most Zeiss lenses are well worth their price. You pay a premium for the name. Hopefully the IQ and overall quality won't drop too. Quality does come at a price. I can't afford the price of Zeiss. Zeiss still don't understand today photography trend, their lenses almost never change the design since 1970 and I don't understand WHY they don't include auto-focus and image-stabilizer in the lenses. Why because most of the zeiss lens supporter they are old they need the auto-focus to keep photo sharp and the stabilizer to help their shaky hand ! Cosina Zeiss lenses ARE over priced. Its all part of a marketing campaign to reach the all important 18-25 demographic. The next phase will be to change the spelling to something cooler "Zice". Corporate tie ins with the NBA. Then some rapper or dj will endorse them simply as "Z" you know cause like its the last letter and nothing should come after it. You will then be able to get your "Z" wear at all the exclusive shops. I want my wearable blue dots and flags. Well Zeiss me! I'm Carl! All money in the pockets of the PR industry and the printers for new headed paper. It never fails to amaze me that the PR gonks still manage to persuade presumably clever and experienced board directors, that a small change in logo/name makes any real difference whatsoever, other than to the balance in the PR company's bank account. You really want to go and shout at those directors "its the product that matters stupid!" His girlfriend Jena will be upset! in my country we always say Carl Zeiss & we don't confuse it with anything because there is no company named Carl in our country because CARL is not a name in our country. ".... your friend Carl is over by the fridge, getting some ice, and there you are with an expensive new Carl Zeiss lens, and you're describing it to someone, and Carl keeps saying 'What? What did you say? Do you want ice?' It's confusing." Confusing? Yes. Not making any sense whatsoever? Yes, indeed. BTW, I am still waiting for a white paper treatise as to why "ARRIFLEX" is now being "only" called "ARRI." Must be a slow news day over there in Germania. Wasnn't ARRI the brand name and ARRIFLEX a camera produced by them? There is no more ARRIFLEX, only ARRI. No more CARL, either. Wonder how long will the name "ARRI" lasts after this silly, daft move. Lucky we don't have a Lucy Leica company. Zeiss seems to be stuck in the black&white era if those photos are anything to go by. but there was Lucy's brother Ernst. Leica was "Ernst Leitz Camera AG" some years ago and Ernst had to leave, just as Carl today. Well Zeiss Ikon dropped the Zeiss to be not confused with Carl Zeiss anymore. the cameras were made for "Carl Zeiss" and had a range of Cosina made Carl Zeiss lenses with M mounts http://www.kenrockwell.com/zeiss/ikon.htm a similar Cosina was also badged as a "Rollie"
You see? You are confused. I mean that company: http://www.ikon.de/en/site/vacant2/About-AssaAbloybe/HISTORY-TEST/ The one that makes security locks. And by the way, its Kyocera not Yashica. Yashica was acquired by Kyocera in 1983. They sold trademark rights of Yashica to MF Jebsen Group in 2008. Okay, I admit I enjoyed the joke and the play of words by DPR. You brought a big grin to my face, thank you. Now Carl will probably finally feel less self-conscious about the ice in his drink. And he may even stop feeling something is wrong with his eyes. Well if his middle name was Franc, it would be KFC. No big deal to me, it is still easyer the Voigtlander. Besides do not good Germans spell Carl with a K. Well I hope no one confussed by all the other Co. named Zeiss.... no more CZ. Normaly we write Karl but for some reasons his name was Carl Zeiss. Poeple at that time thought it would look more educated to write the names more latin like. Same with Markus/Marcus and some others. Could be worse. Remember Kentucky Fried Chicken changing to KFC to be more "hip?" That was about the time they "kiled off" (video-wise) Col. Sanders too. Actually Kentucky Fried Chicken sold the business but not the brand name. So the new owners had to use KFC instead. In some areas you'll see the Kentucky Fried Chicken, which more than likely the owner is getting paid from the person that's using the name. There's one here in the Bay area in Oakland, Ca. I thought it was to hide the word "fried" which had become bad for business. "We've all been there - your friend Carl is over by the fridge, getting some ice, and there you are with an expensive new Carl Zeiss lens, and you're describing it to someone, and Carl keeps saying 'What? What did you say? Do you want ice?' It's confusing." This is the pinnacle of journalism. Lordy. Lighten up. The writers are not journalist. You are mixing up this site with the NYT or San Jose Mercury. Thanks for writing like people speak in 2013 and not like a robot. It's refreshing. And yet they use "Touit"
C'mon, you can tou it, Carl! Can I be your new joke writer for your headlines. I promise I'll never use Carl and Ice in the same sentence again. feel sorry about Carl's death. a brand simplifies communication and resists competition. Do you think Zeiss is just name synonym to premier quality ? Just Ralph Lauren paint at Home Depot. We know Ralph Lauren has no clue about latex paint, it just means Ralph Lauren paint is a high end quality paint. When you pay a Zeiss lens for your Sony camera, you are buying a premier Sony lens. Agree ? No, you are buying lens designed by Zeiss up to Sony parameters. Which obviously include a lot stuff, so they are more compromised than something like ZF.2 135/2. That said, for example ZA 135/1.8 is one-of-a-kind lens. And since Sony parameters for E-mount were bit too restrictive for Zeiss, we now can get Touit lens. Sony won't be that stupid to tell Zeiss how they design and make lenses or Zeiss may do it themselves. for two same lenses, I'd grade one with a Leica or Zeiss brand lower because I'll have to remove these dirt myself with added cost/labor. putomax - than make labor in civilised countries cheaper, and glass for lens too..
My Carl Zeiss lenses are the best lenses I have ever used (Hasselblad and Contax RTS and G2). No difference between the German ones and Japanese ones. They will always be Carl Zeiss lenses. I feel this is a bad move. I like my Zeiss lens, but I never refered about them any other way than just "Zeiss". But I would prefer if ZF/ZE/ZM lens still said "Carl Zeiss" on lens. Its sorta nice tradition. For rest I dont care that much. Japanese Panasonic makes lenses in China and stamps the German name Leica on them. All legal of course, "brands" have huge value in a world-wide economy, and the brand owners are very careful to do licensing deals that don't dilute their brand. I saw a Polaroid (bankrupt many years ago) camera in Barcelona last week; made in China of course. Swiss law stipulates that to put "Swiss Made" on a mechanical watch, at least 51% of the manufacturing "value" has to be in Switzerland -- the rest is usually in China, and since the Chinese workers get paid a small fraction of the Swiss ones, most of the watch assembly is done there before the last few wheels are added in Switzerland. if those Japanese companies look further into the future, they should expect emerging Korean and Chinese companies become tough rivals just like themselves to the Germans half a century ago. it's in the interests of Japanese themselves to kill these German brands for good before they fall into enemies' hands with high value (added by high qualtiy products of Japanese companies). Big mistake. They should have renamed Cosina to - Kaito Zeiss instead. which got no good brand of it's own. Voigtlaender despite being forgotten is probably oldest "living" brand. And for some it has nice sound too. Btw. not all lens from Zeiss are made by Cosina. :) Plus they mostly just construct lens from parts.